Trim Rewinder | KEW ENGG. & MFG. PVT. 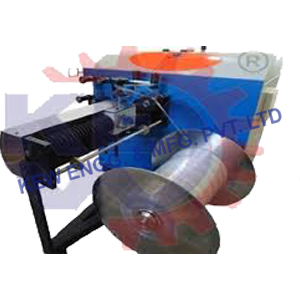 LTD.
KEW Trim Rewinder incorporate many features for high reliability of trim winding. The precision electromechanical traversing system is maintenance free with operator control of the traversing rate which remains constant regardless of the line speed or the spool diameter. This, together with the inbuilt pineapple winding technology, ensures optimum winding of the trim and therefore increases the reliability. The lightweight web guide roll assembly traverses for high-speed operation with the spool running in a fixed position.